If you have any questions or want to enquire about dates, use our form to contact Roger & Liz Pickett or see their website for more information. Discover the mysterious and ancient beauty of the Boyne Valley – you have miles and miles of sandy coastline to explore. Once through the ‘village gate’ you are secluded in beautiful flower gardens, and you can walk along the spreading beach to pubs and restaurants. Roger and Liz’s family has been letting these cottages since 1908 and their warm Irish welcome, with hot scones from the oven and homemade jam, proves they have inherited the hospitality gene. The cottages have been lovingly and impeccably refurbished, making them warmly state-of-the-art with their quilted bedcovers on excellent beds, sparkling bathrooms with underfloor heating, double ended baths and power showers, robes and slippers too. WiFi, flatscreen TVs, CD and DVD players, games and books, local art and pottery, comfy sofas and fully-fitted kitchens, everything is just so. Children will adore it here – there’s heaps to keep them entertained. 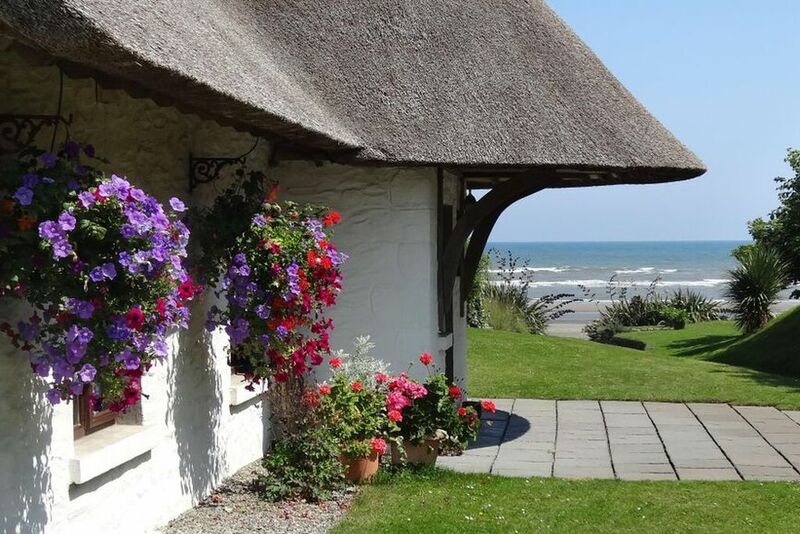 Just 25 minutes from Dublin Airport but the best antidote to city madness (and voted one of the coolest cottages in Britain and Ireland by the Sunday Times! ), you will surely be content. Minimum stay: 3 nights on weekdays. 3 nights at weekends. 3 nights in high season. Short breaks available. €65 pppn. 3-night break €390-€1,170. A truly beautiful place a little slice of heaven. Roger and Liz the owners are two of the most kind and lovely people. The UNESCO World Heritage Site of Brú na Bóinne is just 20 minutes from our doorstep. The Brú na Bóinne passage tombs of Newgrange, Knowth and Dowth predate the Egyptian Pyramids and Stonehenge , a 'Must do' to include on your holiday itinerary. An abundance of Children’s Activity centres including Dublin Zoo, Newgrange Open Farm, Tayto Park, Water World & Funtasia. Dublin City – Theatres, Galleries, Museums, Guinness Brewery, Restaurants (excellent city transport services on the hour). This vibrant, friendly city is world renowned for the variety of sights and activities for all ages both day and night. The Cooley Mountains and Carlingford to the north and Wicklow and the Dublin Mountains to the south both provide a wealth of touring scenery and locations equal in every way to the beauty of the West of Ireland... One of our best kept secrets! Golfing – over 50 golf courses within one hour's drive. Fishing – superb game and sea fishing for experienced and novice alike. Equestrian, outdoor activities, extreme sports and much more. Gardens, 20 open gardens including Powerscourt top 3 in the world.